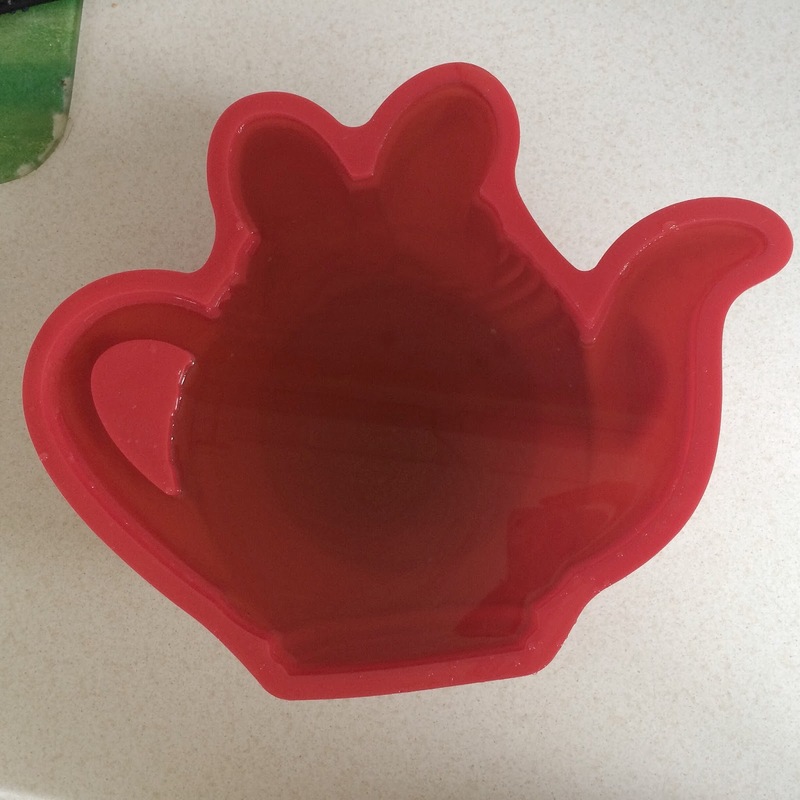 Whilst i was over my aunts when i was down in London, she gave me a load of cook books which also included a 'Disney Cakes & Sweets' magazine along with a teapot jelly mould, as she wasn't using them no more and i love to bake things. In the first week of August I have my niece coming down to Wales for a week, so thought i would try this 'Teapot Jelly' out, just to make sure it turns out just right, as I've said i will make one with her with a flavour of her choice. Firstly make sure you have all ingredients needed (water is needed aswell), i will let you know how much and when throughout this post. Start off by soaking 3 gelatine leafs in cold water and put these to one side for now, Yes i used a saucepan as didn't have another bowl to hand. 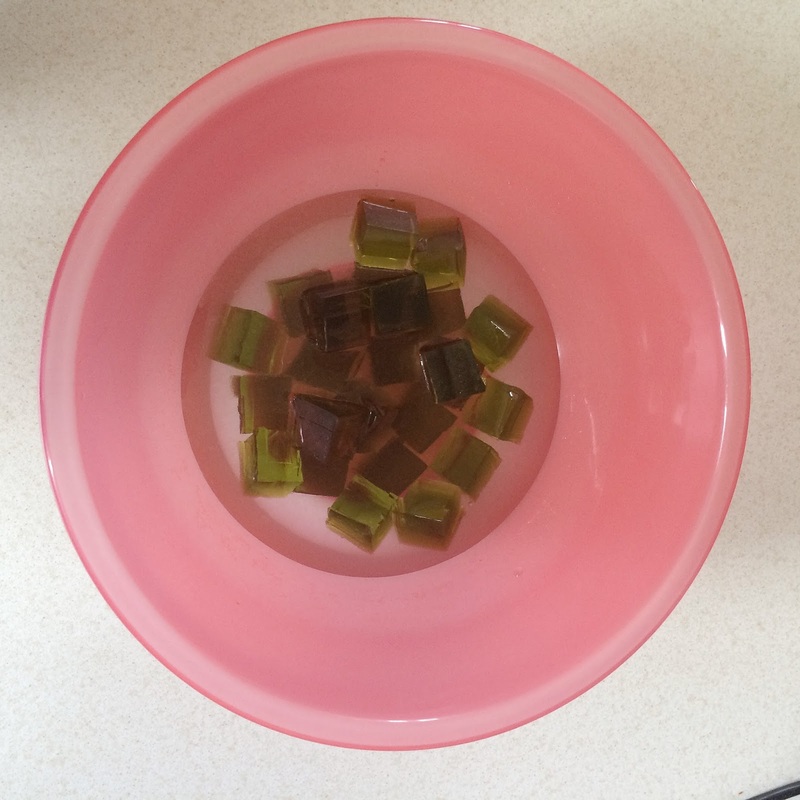 Meanwhile while these are soaking, put 200ml (7fl oz) of water into a microwave proof bowl, and break both packs of jelly into squares and place into the bowl (I used Lime Jelly). 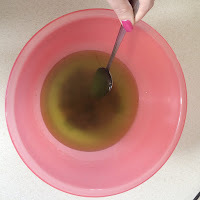 Then place the bowl in the microwave and heat for 2 minutes, once done take the bowl out the microwave and stir the jelly with a spoon until it is fully dissolved. Then go back to your gelatine leaves that you left soaking in cold water and squeeze any excess water out of the leaves and stir all 3 into the jelly. 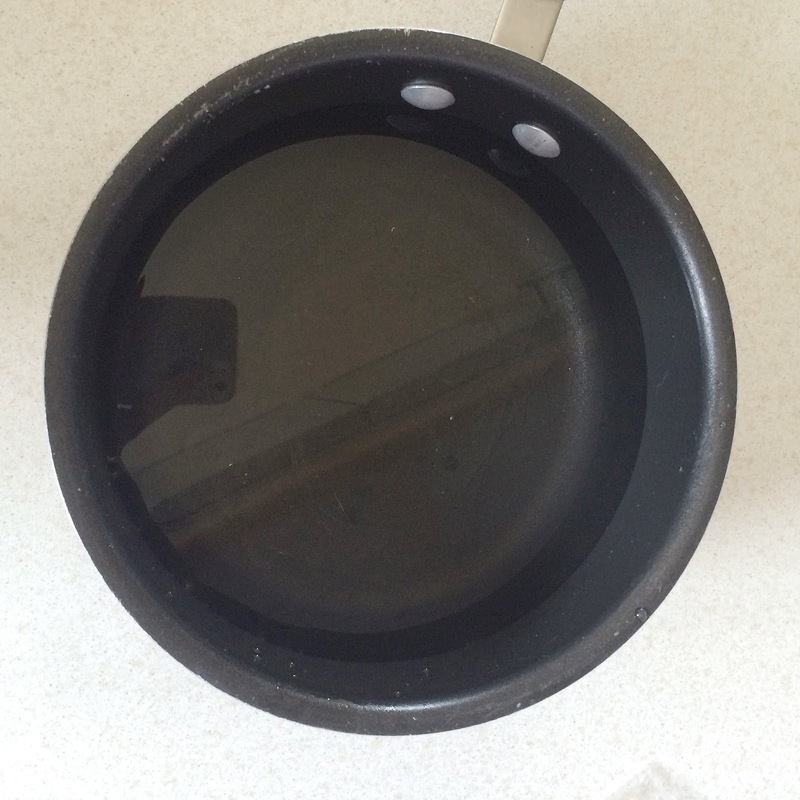 You then want to stir in 1.2 litres (2 pints) of cold water. 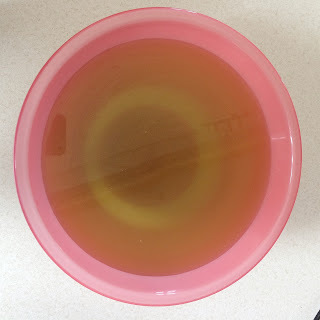 And it should look something like the picture below, although if you've used a different flavoured jelly to what i did, it may be a different colour. The last step is transferring your jelly mix into the mould, you will firstly need to dampen the inside of your mould with cold water and stand it onto a level surface. 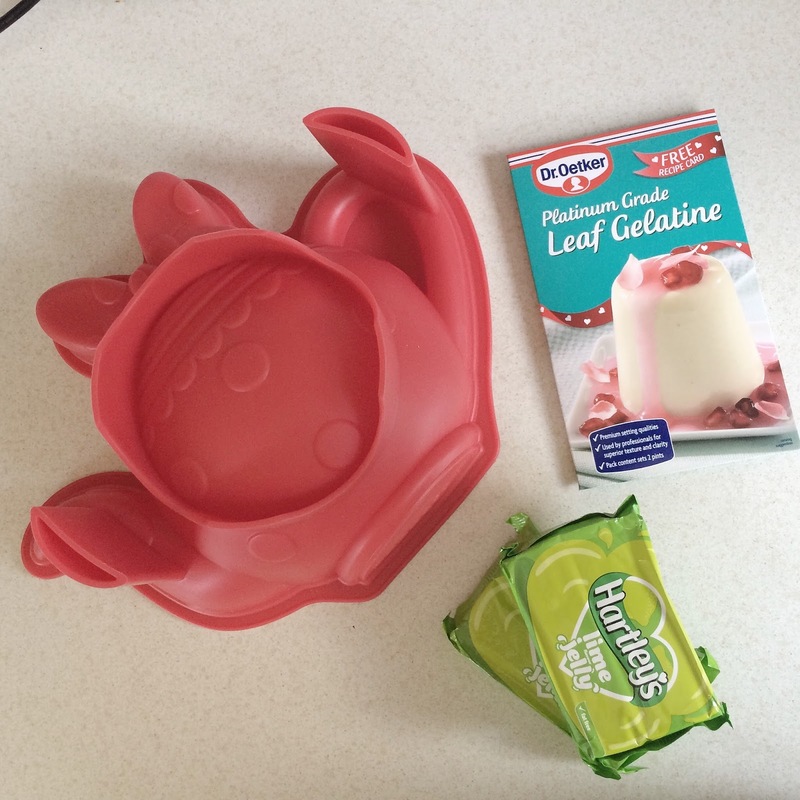 Then slowly pour the jelly mixture into the mould and transfer your mould into the fridge, making sure the surface stays level. This will then need to be left in the fridge overnight to set, however tempting it might look after a few hours haha. If your clumsy like me, you may want to get an extra pair of hands to help you put the jelly filled mould onto a flat board then to help move it into the fridge. 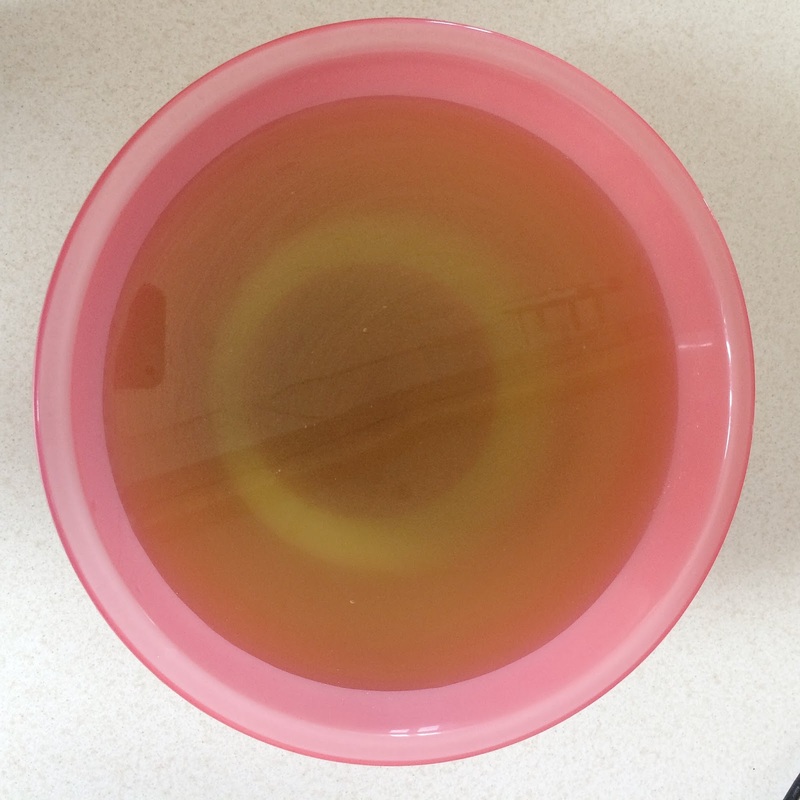 After its been in the fridge overnight, remove it from the fridge and dip the mould into a bowl of hot water just to loosen the jelly. 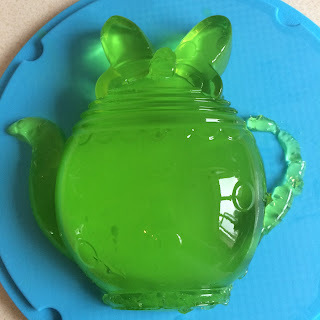 Then put a flat plate over the top of it and turn over to remove the jelly from the mould and serve.....and if its set properly it should turn out like the picture below, or maybe even better! The handle didn't come out properly on mine as don't think I put enough jelly mixture into the handle part, but otherwise everything else turned out fine. Let me know if you try this and if it turned out right for you?